On Good Friday morning, on a brilliant early spring day, a masked bandit stalked our garden. The black facemask and the careful, purposefully stealthy gait definitely gave grounds for suspicion. There seemed something deliberate about him, the way he strode down to the back doors. Grandchildren in their dressing gowns came to stare back at him. The timing was totally wrong. The Easter eggs had not yet been distributed about the garden and were well hidden indoors, if that was the cause of his visit. His colourful black-rendered coat-of-many-feathers and those enormous extravagant, totally over-the-top tail feathers would be a hindrance to any quick get-away and he would stand out brightly in any Police line-up. 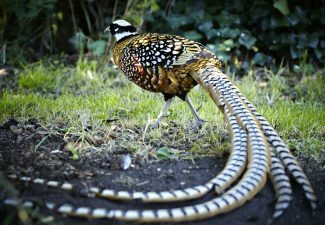 While my daughter dashed out to catch the intruder on camera, I hurried off to google and ascertained he was actually a Reeves ornamental pheasant. A healthy large fox was seen paying close attention from the hedge, but the intruder seems to have made a safe get-away, at least as far as our premises are concerned. 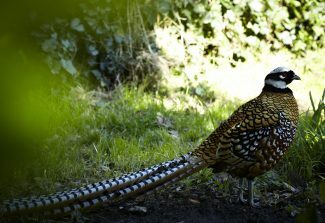 Quite recently a friend reported from Rayleigh on finding a splendid peacock roosting in her apple tree one morning. Had her house overnight been given stately home status? The oven-size bird hung around for a while, approached the house wistfully, inspecting, or perhaps ‘casing the joint’, but eventually took a short flight on to a neighbour’s garden shed. Two obvious questions arise: Has there been a mass break-out of fine feathered friends, or is there some fowl business afoot by an underhand council to beautify the area ahead of the Olympic season, by giving the impression of an Essex paradise, where peacocks strut and long-tailed pheasants glide through Elysian gardens? What a lovely surprise for the old “Dorlie” garden, great photos.